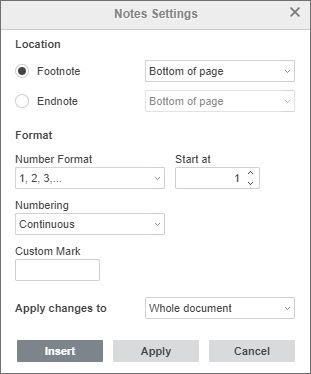 You can add footnotes to provide explanations or comments for certain sentences or terms used in your text, make references to the sources etc. The footnote mark (i.e. the superscript character that indicates a footnote) appears in the document text and the insertion point moves to the bottom of the current page. type in the footnote text. Repeat the above mentioned operations to add subsequent footnotes for other text passages in the document. The footnotes are numbered automatically. If you hover the mouse pointer over the footnote mark in the document text, a small pop-up window with the footnote text appears. in the Go to Footnotes section, use the arrow to go to the previous footnote or the arrow to go to the next footnote. Bottom of page - to position footnotes at the bottom of the page (this option is selected by default). Below text - to position footnotes closer to the text. This option can be useful in cases when the page contains a short text. Start at - use the arrows to set the number or letter you want to start numbering with. Restart each page - to start footnote numbering with the number 1 (or some other specified character) at the beginning of each page. Custom Mark - set a special character or a word you want to use as the footnote mark (e.g. * or Note1). Enter the necessary character/word into the text entry field and click the Insert button at the bottom of the Notes Settings window. Use the Apply changes to drop-down list to select if you want to apply the specified notes settings to the Whole document or the Current section only. Note: to use different footnotes formatting in separate parts of the document, you need to add section breaks first. When ready, click the Apply button. To remove a single footnote, position the insertion point directly before the footnote mark in the document text and press Delete. Other footnotes will be renumbered automatically. select the Delete All Footnotes option from the menu.